You’re never out of a game when you can sock dingers, folks. The Yankees erased a 4-0 deficit Tuesday night to walk-off with a 5-4 win over the White Sox. They’ve won nine of their last eleven games and 16 of their last 22 games. The Yankees are a season high tying 36 games over .500 at 84-48. This was shaping up to be a real frustrating game. Zombie James Shields rose from the dead and shut the Yankees down for five innings, holding them to one hit (an Austin Romine single) and two walks. Shields went into this game with a 4.59 ERA (4.80 FIP) and 26 homers allowed in 170.2 innings. I’m not going to bother to look it up because I don’t really care, but I reckon he hasn’t started many games with five scoreless innings this year. The Yankees were down 4-0 after the top of the sixth (we’ll get to that in a second) and they rallied to tie the game with two two-run home runs. Two slumping hitters got the rallies started. Brett Gardner (.202/.288/.313 in August) stung a leadoff triple into the right-center field gap to start the sixth. Two infield popups later, the Yankees were in danger of stranding their second leadoff triple in as any days. Instead, my main man Miguel Andujar came through with a rocket two-run homer to left. It looked like it was shot out of a cannon. Absolutely crushed. 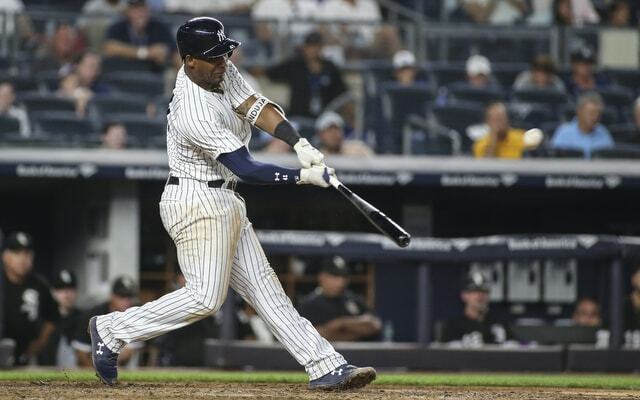 Andujar’s home run got the Yankees to within 4-2. They tied the game in the eighth inning. This rally started with Giancarlo Stanton (hitless in his previous 14 at-bats) smoking a hard ground ball single to right field. Majestic homers and hard-hit ground ball singles to right seem to be this dude’s specialty. Aaron Hicks, the next batter, jumped ahead in the count 3-0 and took what he thought was ball four. Home plate umpire Pat Hoberg called it a strike (it was a strike), the at-bat continued, and Hicks hit a two-run home run to right and he pimped it. Love it. Tie ballgame. Through five innings the Yankees had four hits on 36 (!) balls in play in the series. They struck out three times total Monday and three times in the first five innings Tuesday. It wasn’t like the offense was scuffling because they couldn’t make contact. They made plenty of contact. A lot of of it was weak though, plus the White Sox played some really great defense. On the infield, especially. Lots of hard hit grounders failed to find holes. The solution? Hit the ball in the seats. I approve. Lance Lynn was better than his pitching line (5.2 IP, 7 H, 3 R, 3 ER, 1 BB, 5 K) would lead you believe. He pitched around numerous defensive miscues — on an inning, give or take — to hold the White Sox to one run in five innings. That run scored when Avisail Garcia pulled a ground ball double inside the third base bag and beyond the reach of a diving Andujar (prescient! ), scoring Nicky Delmonico from first. The wheels came off in the sixth inning after two quick outs. Lynn allowed a two-strike single to No. 8 hitter Yoan Moncada and a two-strike single to No. 9 hitter Adam Engel — Engel’s single was another grounder out of the reach of a diving Andujar, this time to his left — then Jonathan Holder allowed both inherited runners to score plus a run of his own. Yolmer Sanchez singled to center and Delmonico singled to left. Hicks tried to get the lead runner at third on the single, allowing Sanchez to take second. Sanchez then scored on Delmonico’s single. Bad fundies there. Lynn did not have a single 1-2-3 inning Tuesday. His biggest escape job came in the third inning, when the White Sox loaded the bases with two outs on a single, an error (Andujar), and a walk. Lynn fell behind in the count 3-1 to Matt Davidson before getting the inning-ending ground out. He again threw lots of fastballs (94 among his 103 pitches) and did about as well as he could’ve Tuesday night given the defense behind him. It sure sounds like a couple of relievers are not healthy right now. Maybe not injured, but beat up a little. Holder tossed 1-2-3 seventh and eighth innings after finishing off the sixth, and when asked about Holder’s work after the game, Aaron Boone said it was huge because the Yankees are a “little beat up, a little short down there,” with there being the bullpen. Hmmm. Maybe David Robertson’s shoulder is acting up again? Chad Green hurting? Not sure. Walker has been in the big leagues for a while now and that is only his second career walk-off dinger. He had one with the Pirates back in 2014. Walker did have a walk-off single a few weeks ago, against the Athletics. This was walk-off win No. 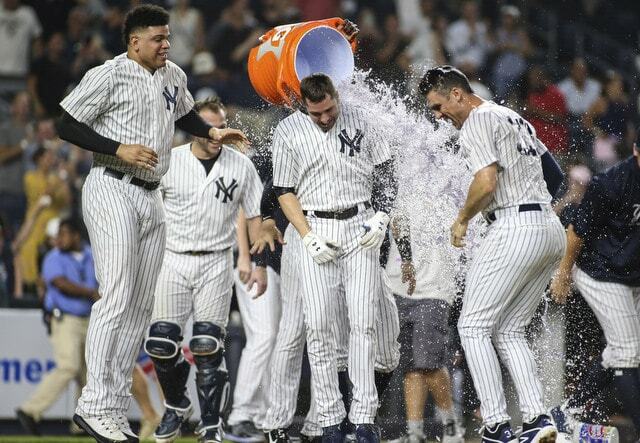 7 for the Yankees this season and their fourth walk-off home run. Stanton (Mariners), Gleyber Torres (Indians), and Gary Sanchez (Twins) have the other three. No runs in the first five innings to five runs (and three homers) in the final four innings. I’ll take it. Another rough game for Greg Bird, who dropped a routine throw from second base on the very first play of the game. Look at this. Terrible. He also went 0-for-4 at the plate and is down to .196/.284/.384 (80 wRC+) on the season. Bird did hit the ball hard a few times, but so what? There have to start being results and soon. Very soon. Luke Voit is already stealing away first base starts. Every Yankee had exactly one hit except Bird and Torreyes, who was pinch-hit for by Walker in that ninth inning. Hicks (homer, walk), Torres (single, two walks), and Romine (single, walk) all reached base multiple times. Remember when Gleyber was slumping? He’s now 15-for-42 (.357) with seven walks in his last 12 games. It was only a matter of time until he came around. The Yankees and White Sox will wrap up this three-game series Wednesday night. CC Sabathia and Reynaldo Lopez are the scheduled starting pitchers for the series finale.